Our tubular crossflow microfiltration membrane systems are designed to remove selected inorganic, organic, or heavy metal contaminants to meet the regulatory compliance and/or water recycle objectives. 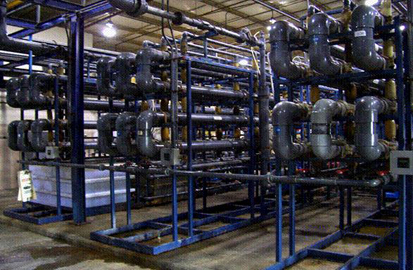 A two-step process makes our microfiltration systems more efficient and reliable than conventional treatment methods. First, chemical pre-treatment converts the contaminants to filterable particulates and mitigates fouling effects. Next, membrane microfiltration accomplishes physical separation of the particles. Using bench-scale or pilot-scale tests, we analyze the contaminates in your wastewater. Using that information, we develop the right chemical treatment process that will remove each one. For example, contaminants such as those that foul reverse osmosis membranes can be removed with proper pre-treatment. The chemical treatment may take the form of precipitation, adsorption, chemical reduction/oxidation, pH adjustment and microbial control. It’s carried out in a two- or three- stage reaction, which will typically include one or more of the following processes: pH adjustment, coagulant addition, powdered activated carbon addition, softening, precipitant addition, or other processes as determined by preliminary testing. After chemical pre-treatment, the wastewater is processed through a microfiltration system designed to separate the precipitates from the water. The wastewater is pumped at a high velocity through membrane modules, which are connected in a series. The turbulent flow, parallel to the membrane surface, produces a high-shear scrubbing action which minimizes deposition of solids on the membrane surface. During the microfiltration operation, clear filtrate permeates through the membrane, while the suspended solids retained in the re-circulation loop are periodically removed from the concentrate tank for further de-watering. An automatic low-pressure back-pulse mechanism provides physical surface cleaning by periodically reversing the filtrate flow direction. Clean-In-Place Keeps Your Membrane Filtration System Working! Membrane cleaning is a routine part of the microfiltration system operation. In the filtration process, chemically pre-treated wastewater is recirculated from the concentration tank through a single or through multiple trains of membrane modules. The interior surface of the membrane tubes gradually become coated with inorganic and organic particles in the wastewater. 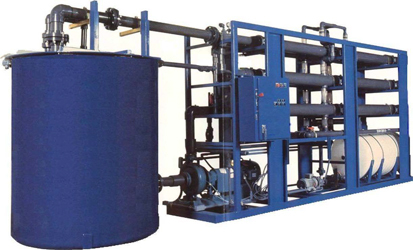 Over time, the effective filtration area is reduced and the filtrate flow or flux decreases. Although effective chemical pre-treatment can extend the time between cleanings, all systems eventually require cleaning. To keep your microfiltration system functioning at its highest rate, Clean-in-Place (CIP) is needed. The extraordinary chemical resistance property of the membrane material we use in our microfiltration systems allows the use of a wide range of chemicals – acids (H2SO4 or HCl),oxidizers (NaOCl or H2O2), and bases (NaOH) for cleaning off the persistent fouling substances. Clean-in-Place (CIP) technology works by circulating the cleaning solution through the modules or soaking the modules for an extended period for more severe fouling events.